Called to Transformation is a tool for you to use as you embark on an asset-based approach to ministry. This is not a linear model, but a rather a model that allows you to work through the process in a way that is most useful to you and your team. The key is that the gifts God has given us are the focus of the model. The gifts you discover in this process are the foundation for the kinds of work you will be doing as a community. The steps that are outlined below are a guide for you. Who: Begin by defining who will be your Called to Transformation team. Will this be used as a tool with the whole faith community or will you use it with a group (like the youth group or women’s group) or committee (like the Vestry or Outreach Committee)? Or, will you use it in partnership with those from the broader community to envision a new reality for your neighborhood, town, or city? Build your Steering Team: Once you have defined who will be engaging in this process, you can begin to build the team of people who will shepherd this process through its various cycles. Purpose Statement: Your team will craft a theological statement as a way of focusing why you are doing this work. Questions to ask might be: Why are you doing this? What is God calling you to do together? Develop a Plan and Process: Your team will then look at the materials and develop a plan and process for how this work will be approached in your context. There are many tools in your toolkit from which to pull. 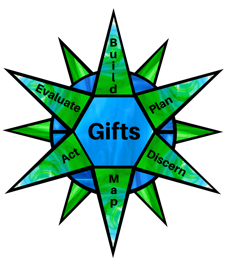 Gifts Discernment: Your team will begin by doing gifts discernment themselves, and then working to help people articulate and name the gifts they see in themselves and others. These gifts (or assets) can take many forms including: gifts that come from humans, nature, structures and buildings, relationships, and are economic, temporal, and spiritual. Part of this process will also invite people to envision a possible future or outcome for their community. Map the Assets: Once you have discovered gifts within the community, your team will spend time mapping the assets you have as individuals, as a congregation, and as a community. Take Action: It is now time to act and begin doing the work you are feeling called to do! Celebrate and Evaluate: After a given period of time (that your team will determine) you will need to come back together to evaluate where the project is and celebrate what you have done together. This is not the end, but a time to continue the work and begin the cycle again of looking at what God is calling you to do. While you can begin doing this program at any time of year, you may want to think about how this will work in the context of your faith community, the cycle of the Church Year, and the life of your community. Stewardship Season – It would work well to begin this in the fall with Stewardship season, beginning the conversation about gifts and what we all have to offer from the gifts God has given us. Advent – Advent is the beginning of the Church Year, where we are all called to watch and wait for where Christ is present in our lives. Advent calls us to notice where Christ is present, where we are blessed with gifts, and how we bring those forth to the world around us. Pentecost – Pentecost is the birthday of the church, the day in which the Holy Spirit descended on the apostles and blessed them with tongues of fire. 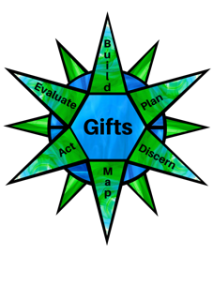 It is a great time to discern our gifts and giftedness. Theological Reflection – Through each step of the process, we invite you to stop and do theological reflection or theological grounding. There are suggested passages and questions in each section. Communication – How are you incorporating the team and the wider community? How are you generating enthusiasm and ownership for the process? Action – What are you “doing” at this point in the process? What are your Action Items? Celebration – How can you incorporate and create ritual around recognition of completion of this cycle? As you work through this material, keep in mind the non-linear and cyclical nature of this program. You may want to impose an “order” on what is being presented or want a specific definition of the “right” way to do this. However, this material is not being presented as a recipe to follow in exact order. Rather, everything is offered as a resource and possibility that should be organized and tailored to the context of your particular community. Rely on the wisdom of your team and the guidance of the Spirit to determine which pieces and parts of the cycles of this toolkit that you will incorporate and how.